Convert PDF to EPUB eBooks. 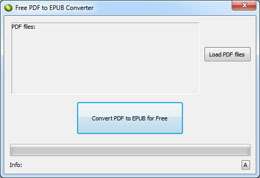 LotApps Free PDF to EPUB Converter can help you convert PDF documents to EPUB (short for electronic publication; alternatively capitalized as ePub, ePUB, EPub, or epub, with "EPUB" preferred by the vendor) eBooks for free. Convert PDF to Microsoft Word (docx), Keep original text, images, layout, etc. Convert PDF to PowerPoint (pptx) for free, Keep original text, images, layout, etc. Convert any Adobe PDF document into popular image formats, png, jpg, bmp, gif, tiff, tga, xmp. Convert PDF to EPUB, So you can read eBooks more easily on your iPad, iPhone, iPod Touch, Sony Reader or other eBook Readers. Make your PDF documents visible and fully searchable on the Internet, while preserving the original formatting, links, images, etc. Convert any Adobe PDF document into a Macromedia Flash (SWF) movie with the original layout, image graphics and formatting. Convert PDF to Text format - Fast, Accurate and Free! So you can edit and reuse your PDF content. LotApps PDF To JPG Converter is a free windows utility that quickly convert PDF Files into JPG images. LotApps PDF to PS Converter can convert PDF to PostScript file without requiring any Adobe product.